Roscoe Pond posted a video of August Schellenberg promoting the NBA All-Star Game. In it, Schellenberg plays a wise old Indian who conjures images of a bear, snake, wolf, and eagle from a fire. These morph into shots of NBA players embodying the animals' attributes. Rob's review: On the plus side, it's great to see a Native linked to something as non-Native as an NBA game. Schellenberg looks and acts like a typical modern Indian, not like some ancient chief or shaman. On the minus side, the whole concept is somewhat stereotypical. It would've been better to incorporate a Native without the clichéd bear, wolf, and eagle references. 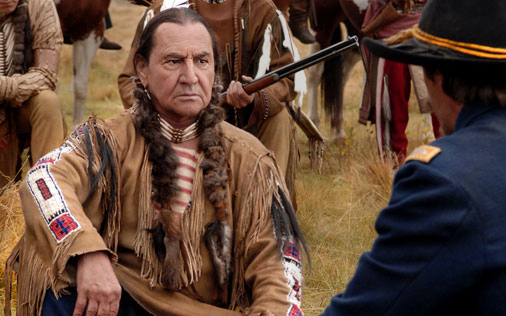 Below: Schellenberg in Bury My Heart at Wounded Knee.